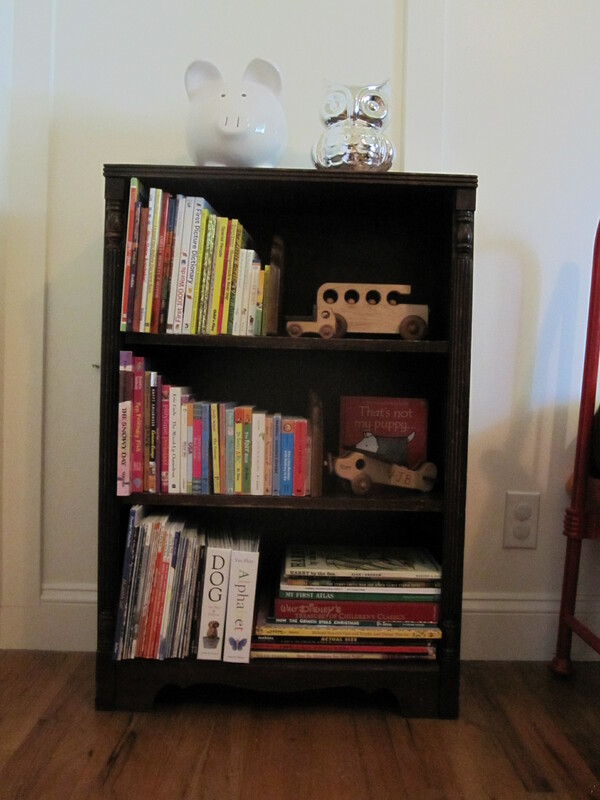 We have this little bookshelf in the boys’ room. My mom gave it to us, but it was originally her grandparent’s shelf. It’s functional and cute, right? 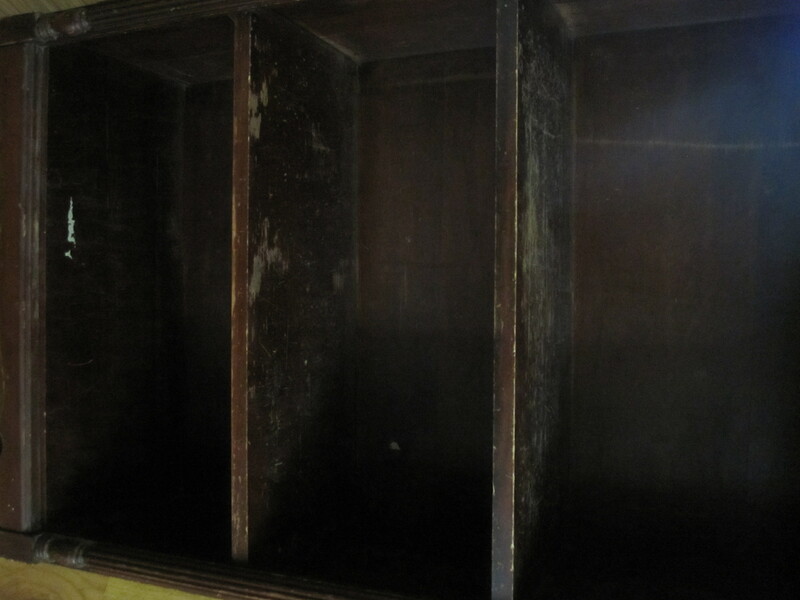 Well, it’s not so cute when the books have been removed; the finish has seen better days. The top was even worse, too! We have had this bookshelf for three years (or more) and have never done a thing to it. Until now, that is. I finally got an itch to refinish this sad little guy. 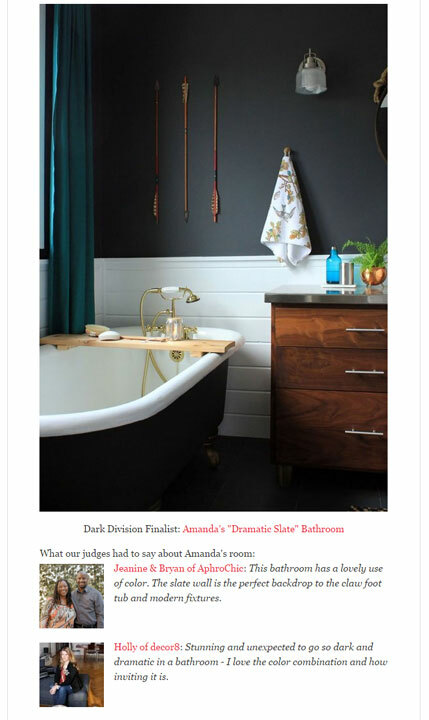 It all began with a random orbital sander. 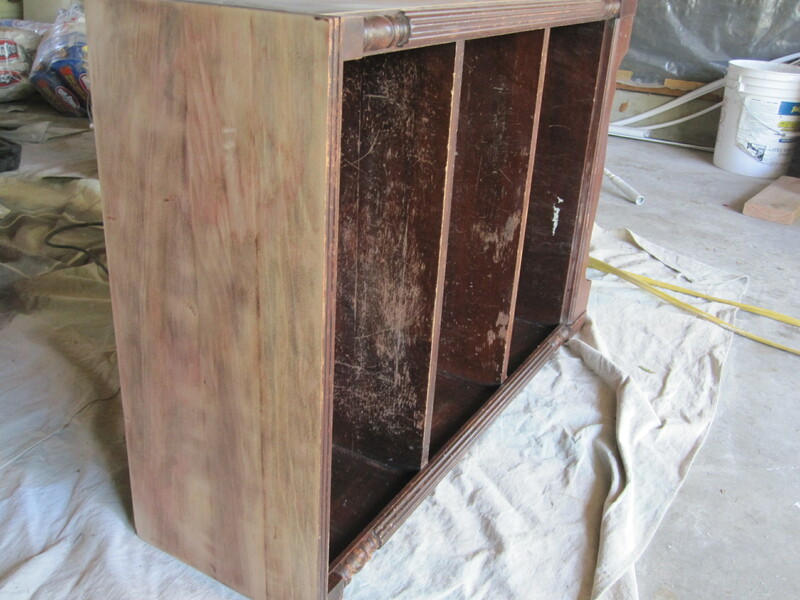 I started by sanding the top with 220 grit paper to completely strip the stain finish. Then, I worked my way down the sides, sanding with the grain of the wood. Once I had the top and outsides sanded, Ben removed the back and I worked on sanding the fixed shelves (both the top and under sides) as well as the inside walls. After completing all the smooth flat surface areas, I began the tedious, time-consuming task of hand sanding the detailed areas of fluted half round and the finials. This involved 100 grit sandpaper, folded in half to get into the crevices of the fluting. It took a good two hours to get the detailed areas sanded smooth, but I knew the end result would be worth it. 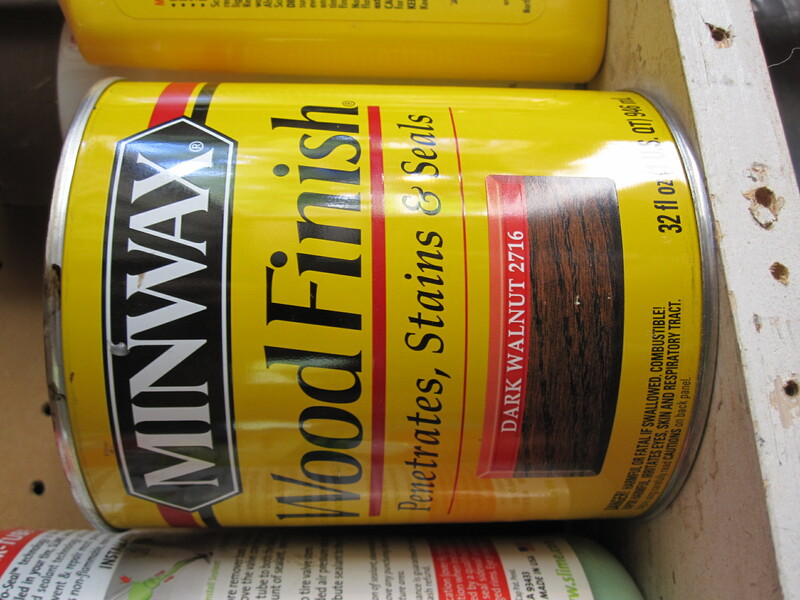 I wanted to keep the dark wood tone, so I bought a quart of Minwax Dark Walnut stain. 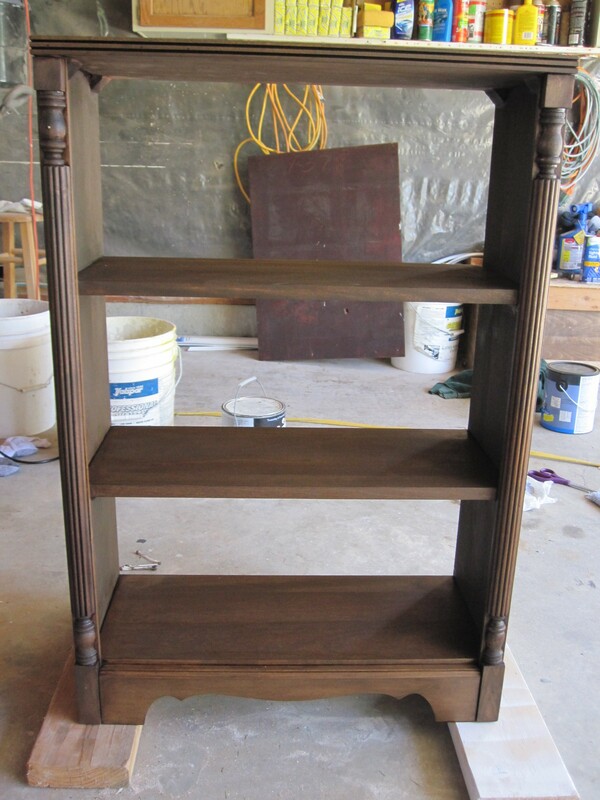 Using a synthetic bristle brush, I began applying the stain in small areas to the shelves. Working quickly, I wiped the area with an old, cut up T shirt to remove excess stain. 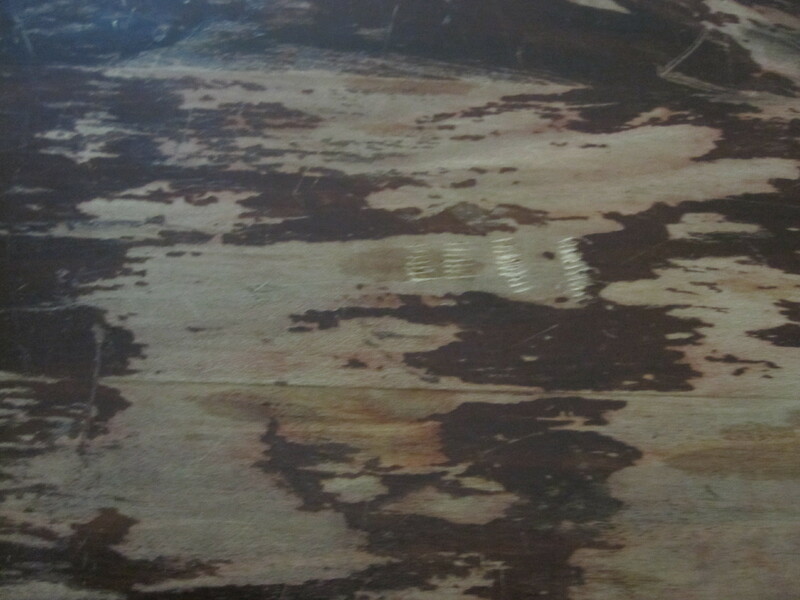 I kept a ‘wet edge’ of stain to prevent any overlapping that might make the color uneven. I continued this process until the entire bookshelf had a coat of stain. I let the stain dry overnight. Once Everett went down for his morning nap, Vincent and I went back to the garage to give the shelf one more coat of stain. 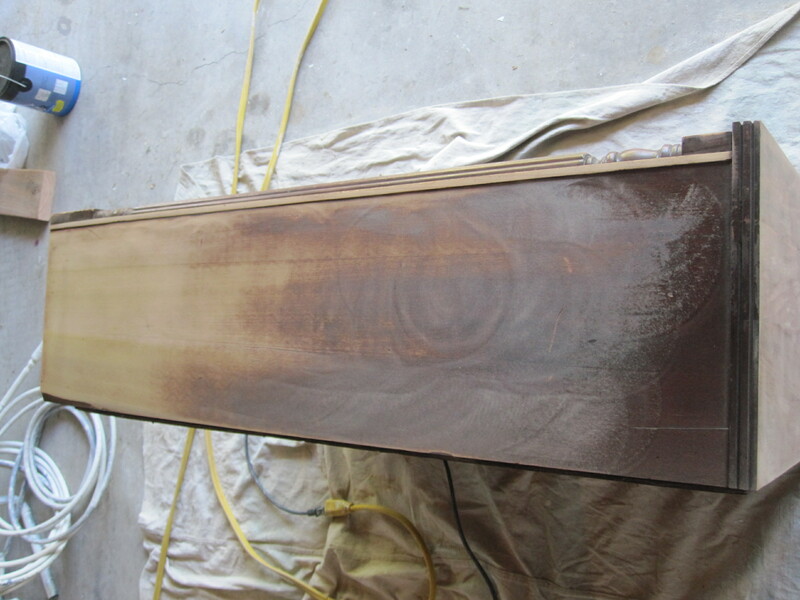 The second coat gave the rich, luxurious walnut tone I had in mind. Now that I had the color I wanted, I needed to protect my hard work. I applied two coats of Varathane Diamond Water Based Polyurathane satin finish to seal the wood and prevent scratches and future damage. 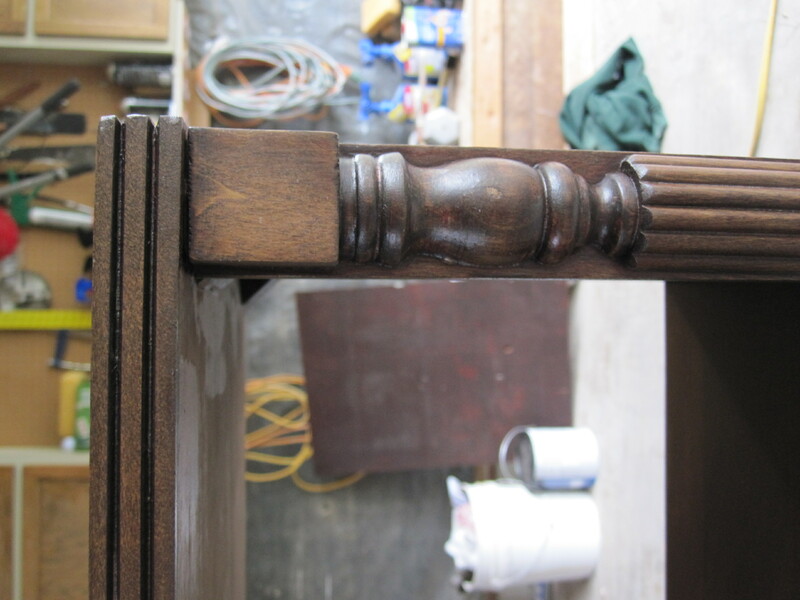 Just a little note: This was my first attempt to completely refinish a piece of furniture. By no means am I an expert, but I think the bookshelf turned out pretty great. It was time consuming, but not very difficult or expensive. Speaking of expenses, I here’s a budget breakdown.